Cash Seizures by Police Prompt Court Fights Law enforcement officials can confiscate money without ever charging anyone with a crime, as long as they can prove it's tied to illegal activity. But sometimes they take money even when they can't connect it to a crime. Second installment of a four-part series. 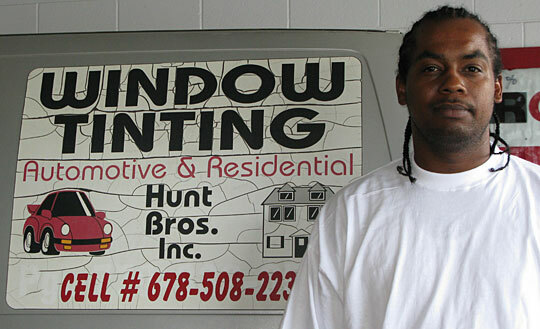 Chris Hunt, standing in his Atlanta auto-detailing shop, is fighting a federal prosecutor to get his $5,581 back. Michael Annan had $43,720 taken from him in a traffic stop by Georgia deputies. Read the details of his case. The law states that authorities can confiscate your money without ever charging you with a crime, as long as they can prove it's tied to illegal activity — but sometimes it happens even when they can't. Jim Wells County in the southern tip of Texas, named for a 19th century political boss, has one of the most successful and aggressive highway interdiction programs in the state. In the past four years, authorities have seized more than $1.5 million, primarily off of U.S. Highway 281 — a prime smuggling route for drugs going north and money coming south. "We've been working southbounders for the money and weapons that are going back to Mexico," says Capt. Ray Escamilla of the Jim Wells County Sheriff's Office. His office wall is covered with pictures — not of dope busts, but of piles of confiscated cash. He recalls some of the big ones: "October 2001, $105,000. November 2003, $99,000. October 2004, $668,000." By seizing money from drug cartel couriers, the sheriff's department — once underfunded and poorly equipped — now can rely on drug assets for a third of its budget. "We've helped the schools [with] cops in school [and] vehicles," Escamilla says. "I think every year we've bought three to four vehicles, all of our equipment, guns, high-powered rifles, all bought with forfeiture funds." But has Jim Wells County become so reliant on seizing drug money that it's shaking down innocent motorists? "You don't want to take the money from any John Doe," Escamilla says. "If you can't prove that it's been a criminal activity, reasonably suspicious, probable cause, you don't want to take it, 'cause it'll look bad in court." And that's what happened in the case of Javier Gonzalez — it looked bad in court. On Oct. 20, 2005, Gonzalez says he was driving south on U.S. Highway 281 from Austin to Brownsville to look at a car and buy a gravestone for his dying aunt. Gonzalez, who owns a car lot, was carrying $10,032 in a briefcase. "As I was driving south, I noticed a dark bluish unmarked car that was taking radar. He basically got behind me, followed me for a while," he says. About 90 miles north of the Mexican border, two sheriff's deputies of the Jim Wells County Task Force pulled him over for driving without a front license plate. "He asked me to get out of the car. I did," Gonzalez says. "He asked me for my driver's license and insurance. I gave it to him. He asked me if I had weapons, drugs or large amounts of money. I told him I did." The police video shows Gonzalez with a shaved head, wearing baggy shorts, standing beside a Mazda. The incident report states the deputies grew suspicious when Gonzalez and his passenger both appeared nervous, and a drug-sniffing dog signaled the presence of drugs. The deputies took them in for questioning and searched the car. They found no drugs or weapons. Though Gonzalez said he was a businessman and showed them a credit card printed with the name of his car lot, the officers didn't believe him. "He suspected we were using the money to go south and buy drugs," he says. The deputies handed Gonzalez a waiver: If he signed over the money and did not claim the currency, he could walk away free. If he did not sign the waiver, he would be arrested for money-laundering. Gonzalez signed the waiver and gave up rights to his money. "So at that time we got in our car and we left, still trying to figure out what just happened. We got officers that took our cash. We got officers that told us we can't get an attorney. So I'm thinking, are these guys officers of law? Did I just get robbed of my money?" Gonzalez hired an attorney, who filed a federal civil rights lawsuit. The county fought it, and lost. In April, the county returned his $10,032 and paid him $110,000 in damages, plus attorney's fees. Ron Barroso, a longtime criminal defense attorney in nearby Corpus Christi who was not associated with the case, says, "I believe a lot of these stops are fishing expeditions, nothing more. They figure they stop enough people out there that they can profile, for whatever reason, sooner or later they are going to hit on something." Civil forfeiture is different from criminal forfeiture. In criminal forfeiture, the taking of property is usually carried out after the owner is convicted of a crime. In civil forfeiture, the government seizes the property — in this case, the currency — without ever charging the person with a crime. The government must show by a preponderance of the evidence that the money is dirty; then it's up to the owner to prove that his cash is clean. San Antonio attorney Michael McCrum, a former federal prosecutor and police officer, says he believes the system is tilted against the property owner. "The laws are made now such that anybody that has cash seized from 'em, the burden of proof shifts over to the person whose money is seized to prove that it's legitimate money. And frankly, a lot of people don't want to declare they have a lot of cash, for other reasons not related to drug trafficking," McCrum says. Which leads us to the second case — Christopher Hunt, a 28-year-old African American who owns an auto-detailing business in Atlanta. Here, the facts are more complicated than the Gonzalez case. On Sept. 2, 2007, Hunt says he was driving south on I-75 through central Georgia on the way to see his mother in his hometown of Dublin. Hunt was wearing his hair in braids and driving a friend's orange Dodge Charger, when two Lamar County sheriff's deputies pulled him over for speeding. The police video shows the deputies and Hunt standing beside the interstate, arguing. The incident report states they became suspicious when they saw that Hunt had a licensed handgun lying on the console, and that he had bloodshot eyes, his hands trembled, and he and his passenger gave evasive answers when questioned. But what really got their attention was the $5,581 Hunt had stuffed in his pockets, which he said was the weekend profits from his car-detailing business. In the police video, one deputy says, "Look man, here's the deal. We're gon' take this money into our possession, OK?" Hunt responds angrily: "Oh no, I'm not giving you authority for you to take that money into your possession." The deputy, emphatically: "I'm taking the money," and he informs Hunt they'll take it back to the department to count it again. The deputy smelled burned marijuana. The deputy observed "an untestable" amount of what appeared to be marijuana on the floorboard. Drug dogs detected drug residue on the currency when it was brought back to the station. Hunt has not been charged with any crime as a result of the traffic stop. So the question arises: Why is the government trying to take his $5,581? The federal prosecutor refused to comment because the case is pending. He has offered to return half of Hunt's money. But Hunt's attorney, David Crawford, says they want all of it back and that they're considering a civil rights lawsuit. "It's an abuse of power, and we're not gonna let them hide behind their police powers and the legal system. We're gonna keep pursuing this until we get justice," says Crawford. Hunt concludes, "It was my hard-earned cash. They had guns and badges and they just took it. If I would have been a drug dealer, I would have just left them and let them have the money." NPR showed this case to attorney David Smith of Alexandria, Va., a former deputy of the asset forfeiture section in the Justice Department and an author of two volumes on forfeiture law. "I can tell you I never see a complaint like this filed in the Eastern District of Virginia. In fact, even if they had loads of evidence, they'd probably hesitate to file a complaint against $5,000 just because it's a waste of time. But to file it when there's so little evidence, as in this case, is really striking," Smith says. NPR examined 14 other federal currency forfeiture cases from Lamar County, Ga., over the past four years. In some of the cases, the drivers had prior felony convictions for narcotics. But there are other cases similar to Hunt's, in which the government confiscates the money because the car smelled like marijuana, the deputy said they acted nervous, they were carrying a wad of cash, and a drug dog alerted on it. "Something is rotten down there, I can tell you that," Smith concludes. Forfeiture abuse is nothing new. In the 1990s, the media reported stories of police running roughshod over the rights of innocent property owners. It led to the Civil Asset Forfeiture Reform Act of 2000, or CAFRA, which was supposed to raise the government's burden of proof before it could seize a person's property. The government maintains those reforms worked, that safeguards are in place, and individuals can challenge a seizure — just as Gonzalez and Hunt did. "I think a lot of people thought after passage of federal reform law that most if not all problems with civil forfeiture were solved. And I simply don't think that's the case," says Scott Bullock, senior attorney at the Institute for Justice, a public interest, libertarian law firm in Washington. Smith, who helped write the CAFRA reforms a decade ago, adds, "There's still a lot of abuse. There are large parts of the country where prosecutors can get away with bringing bad cases because judges tolerate them." The reason you don't hear about more abuses, he says, is that a person has to hire an attorney to challenge a forfeiture, and a lawyer often charges more than the amount of the seized cash. Under CAFRA reforms, if the government loses a civil forfeiture challenge it must reimburse the lawyer, but many individuals may be unaware of this fact when they decide not to pursue their money. Richard Weber, chief of the asset forfeiture section of the Justice Department, was asked if he found these cases troubling. They're insignificant, he said, compared with the thousands of traffic stops where major drug money couriers are busted. "What's troubling to you?" Weber asks. "That a drug trafficker who's bringing money from the U.S. to Mexico, who's carrying hundreds of thousands of millions of dollars in cash in their pickup truck, who just sold dope and crack and cocaine to children in your playgrounds, and his money is being taken away? That troubles you?" On March 15, 2007, Michael Annan was driving his black Nissan Maxima south on I-95 through southeast Georgia. He had just gotten off his job on a dredging barge and was on his way home to Orlando, Fla., when he was pulled over for speeding by deputies in Camden County, just north of the Florida state line. Annan, a 40-year-old immigrant from Ghana, was carrying $43,720 in hundreds and fifties rolled up in a sock in the pockets of his overalls — everything he had saved from nine years of work in Florida and Georgia. But because he did not trust banks, or his then-wife in Orlando, Annan was carrying his life savings in his pocket. "They open my car engine and they try to find something," Annan said in an interview from Brunswick, Ga. "But I don't have nothing in my engine, and I don't know what they thinking. ... After that, they said they would take me to the office." At the sheriff's office, a drug dog was brought out to sniff his car, but it detected no narcotics. Annan says he showed them a pay slip from his employer, Great Lakes Dredging. Annan had no drug arrests. Undeterred, the officers confiscated the money anyway, explaining they needed to investigate whether it was drug money. They said he could call them back in two weeks. Annan says he did call back, a half dozen times, but that no one would help him. So he took a day off from work to drive to the county seat of Woodbine, Ga., to visit the sheriff's office in person. He said they told him they were too busy to see him. So he hired an attorney in Brunswick, who faxed Annan's work records and tax returns to the sheriff's office as proof he wasn't a drug dealer. Camden County then returned his money. The lawyer charged him $12,000 — more than a quarter of his savings. "I think maybe they see money like that ... maybe they thought I was dealing with the drugs ... how can a black man have this much money in his pocket? I think they robbing me, I can't understand they can stop someone and take his money," he says in heavily accented English. His attorney, Paula Crowe, who is familiar with Camden County, says that in her experience, she's sure Annan never would have seen his money again had he not hired a lawyer. Lt. William Terrell, of the Camden County Sheriff's Office, said the highway interdiction team was just doing its job. "The deputies, with all their training and experience, were acting in good faith as sworn officers doing their job. They were not trying to take Mr. Annan's hard-earned money, they were simply trying to verify that the $43,000 was not money made in a drug transaction." Camden County has an aggressive highway interdiction program that has earned the sheriff's department more than $20 million over the past decade and a half. Sheriff Bill Smith — once considered one of the most successful sheriffs in the nation at confiscating drug money off the highways — is now the subject of a federal grand jury investigation into whether he misused the forfeiture funds. "To use this one incident to paint a picture of our agency is neither accurate nor fair," Terrell says. "We have seized millions of dollars that did indeed belong to the drug cartels. We have also seized thousands of pounds of cocaine, marijuana and all the other drugs that plague our society." In this police video clip, Chris Hunt and a Lamar County sheriff's deputy argue about counting the money that was eventually seized. Hunt was not charged with a crime in the incident.